The Masters course at Manila Southwoods is one of the tougher Jack Nicklaus courses is Asia, perhaps the toughest. Being a so called “signature course” which means a little more of the Great Bear’s time was spent on location than would be the norm. The Southwoods Golf & Country Club is unusual in having two signature Nicklaus courses on the site (the other is called Legends) and it is perhaps for this reason that one of them turned out to be as tough a track as it is. 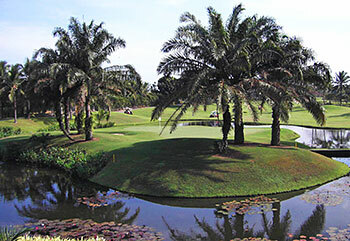 The Masters course has hosted several Philippine Open Tournaments as well as the 1996 World Amateur Team Championship. The course features trouble at every turn. Fifteen holes incorporate water as a hazard. The course guide comments that the 366-yard 1st should be regarded as “a gentle start to a bear of a course”. Things toughen up considerably at the 2nd and the gloves are fully off by the time we reach the 6th which is the stroke one hole. Nicklaus courses are by no means everybody’s favourite. I for one would question the placement of bunkers alongside water, and the use of large tracks of shallow sand and the persistent reflex to select water as the hazard of choice. The Masters course at Manila Southwoods is a high-octane version of a Nicklaus course for the tropics and it is a hugely enjoyable day out on one of the tougher courses in the region. The Manila Southwoods Golf & Country Club is composed of two flat 18-hole courses, the Masters Course and the Legends Course. The Masters Course design strategy is punctuated by traps and water hazards while high mounds characterize the Legends course. The Masters Course’s layout is demanding because the total length is over 7,200 yards, with well–positioned lakes, creeks and bunkers. Water comes into play on 15 out of 18 holes. Another feature is that many hazards are placed on the left side of the fairways and the greens, as often seen in Nicklaus designed courses. So, this course is suitable for fade ball hitters with high trajectories. The par 4 415-yard 6th is a dogleg to the right, handicap-1 hole. The bunkers on both sides of the narrow fairway come into play off the tee. There is a pond on the right side of the fairway and a river beyond it. The approach shot is over the river to a deep green guarded on both sides by deep bunkers. The best angle to the green is hitting from the right half of the fairway to avoid carrying over the very deep bunker protecting the left side of the green. The par 4 429-yard 10th consists of a slight dogleg to the left. A shallow creek runs along the fairway on the right and forms a pond in front of the green. Compounding the difficulty is that the pond guards the entire right side of the green. There isn’t a single bunker on this hole but it is still a good hole and difficult too. This hole was selected as one of the best 500 holes in the world by US Golf Magazine in 2000. The championship tee is unique as it floats on a pond. The par 5 541-yard 18th is a neat, slight dogleg to the right. There is a creek and a pond on the right. A bunker 30 yards in front of the green comes into play for long hitters. The bunkers around the green are strategically placed. To read more about the Masters Course at Manila Southwoods Golf & Country Club, click here to visit my website.